An Iranian cargo plane planning to land at a Yemeni airport was barred by Saudi jet fighters from entering Yemen’s airspace on Thursday. Iran’s semi-official Fars News Agency said the plane was carrying “humanitarian aids.” The Saudis could have suspected that the civilian cargo plane was carrying arms for the Huthis. Iran has in the past regularly used civilian cargo plane to carry arms to Iraq and Syria. Iran began air operation between Tehran and Sanaa in early March of this year after the Huthis had taken over the capital. Mahan Air was the first airline landing at Sanaa international airport and maintained daily flights until the Saudi-led coalition began its air campaign nearly a month ago. This was the first attempt by an Iranian carrier to enter Yemen after the Saudi announced that they had halted the air campaign and instead would use air assets only against specific military targets. Fars did not disclose which airliner and what type of equipment were involved in today’s disrupted attempt. The plane returned to Tehran safely. Looking at the state of the IRIAF I wouldn't be surprised at the least if Saudi Arabian airpower could easily blockade Iranian airspace.These are the results of 36 years of the Ahkoondi regime. 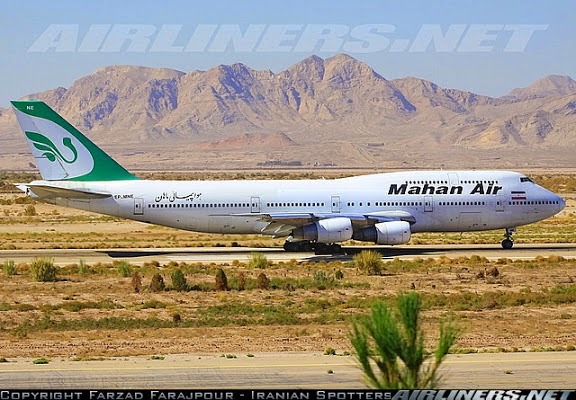 I flew with Mahan Air some 15 years ago. I'm shocked to know that their commercial airplanes are used for transferring weapons these days. Sad they went into weapons smuggling business. Way too creepy! We are not sure if a Mahan Air cargo plane was involved in the Yemeni episode. But as explained in the description of the file photo, we say that Mahan's cargo planes have been identified as carrying arms to Syria. BTW, you flew a passenger plane, the plane involved in Yemen was reported as a cargo plane.